Every home needs a ladder to help in making repairs, cleaning, and arranging stored items. It’s useful to have one tall enough and sufficiently strong for your needs, but portable for everyday use. At my home, it was time to upgrade my old wobbly wooden stepladder to something new, strong, and lightweight. 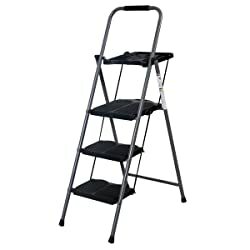 After considering the best options, I purchased an aluminum multi-purpose ladder to help me with all my tasks around the house. I’d like to tell you more about it below. When I found the OxGord Folding Scaffold Multi-Purpose Ladder, I was delighted. It folds into several positions so I can use it as a telescoping ladder, a twin stepladder, and a base for scaffolding. At its tallest extension, the ladder reaches a height of 12.5 feet so I can clean gutters. When folded up, it’s only 3.33 feet tall so it fits in a small storage space. It weighs 24 pounds, which makes it light enough to move around the house and yard for all the jobs I want to do. The hinges have levers that automatically lock into place, so it’s easy to set up the ladder just how I want it. When it’s time to take it down, all I have to do is flip up the levers and unlock the hinges to fold the ladder. The OxGord is made from aluminum, so it will never rust. Although this is a lightweight metal, the ladder supports up to 350 pounds of weight. Unfortunately, it does not have an official ANSI safety rating. There is only a 60-day warranty. One, the customer reviews of this ladder were generally positive. Two, the company that sells them also has mostly positive reviews about their service and the other products they sell. I decided to take a chance on it and see how it worked out around the house. So far, I’ve used it in three ways. First, the scaffold position creates about a 6-foot long workspace about three feet off the ground. With a plank secured on top, it works great for painting a ceiling. Two, the 6-foot tall stepladder position is perfect for changing a light bulb or dusting off a ceiling fan. The ladder opens up into an inverted “V” shape for this purpose. Three, the full extension of the ladder out to 12.5 feet let me clean the house gutters. The top props against the roof just like a telescoping ladder. It comes with two wide stabilizer bars with feet for the bottom of the ladder. The rungs are a foot wide. The thickness of each rung is typical for an aluminum ladder, just enough to support the arch of my foot when I stand on it. Although the rungs have a texture on them, they are slippery when wet, just like any aluminum ladder would be. So far the OxGord ladder is a big help around the house. I can imagine that it will continue to be useful for years to come. If you don’t need all the functionality of the OxGord Multi-Purpose ladder but are searching for a simple stepladder instead, you might enjoy one of the other two models I considered purchasing. Little Giant makes the Flip-N-Lite 6-foot Stepladder to support up to 300 pounds of weight. It meets OSHA standards for safety and has a Type 1A ANSI rating. This is the certification that I had looked for but didn’t find on the OxGord ladder. Although this aluminum ladder is very strong, it only weighs 14 pounds itself. Its hinged design makes it easy to open and close with just one hand. But like the OxGord, if it gets wet, the three metal bottom rungs can be slippery underfoot. The ladder frame extends up past the platform to provide more support with a handrail. The fourth step is the large platform. It’s 45 inches off the floor. That’s as high as this ladder goes, and it’s the main reason I didn’t purchase it. If you need something taller, please take a look at the OxGord ladder I’m using at home. If you would like wider rungs for comfort or safety, please take a look at the next stepladder below. The 3-Step Ladder from Giantex is a convenient step-stool for reaching high shelves. The top platform isn’t for standing and doesn’t look like the rest of the steps. It has grooves to hold various tools and a bucket. The stepladder can support up to 330 pounds, but it doesn’t have an official ANSI rating. The ladder opens and folds up easily. When folded for storage or transport, it’s only 2.8 inches thick and 57.3 inches tall. It weighs about 16 pounds. Each of the three steps is roomy and comfortable to stand on, with the top step the largest of all. It measures 13.8 by 13.8 inches and it’s 27.2 inches off the ground. There is a handrail that extends over the top of the ladder. Its limited height was the main factor why I didn’t buy this one for my home. This is a great ladder for persons with limited mobility because the steps are large. The top platform keeps cleaning materials and tools right at hand. Shopping for the right step ladder can be a little tricky. I did a lot of research that included learning about product features and reading user reviews. I hoped to find a versatile stepladder that would have sufficient height to allow me to complete all my tasks with one tool. Portability and storage are always factors for me. I don’t like clutter and I want to be able to use my tools without straining my back. A ladder that is comfortable and easy to use means I won’t put off doing the jobs I need to do. 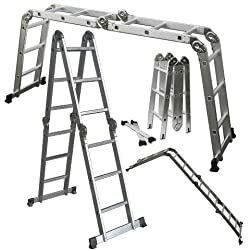 I wanted a ladder that would have a safety rating or weight allowance high enough that it would cover anyone in my family that might need to use it. The OxGord Folding Scaffold Multi-Purpose Ladder locks into various positions to serve seven functions. It extends out to 12.5 feet or can be used as a 6-foot stepladder, or a 3-foot high scaffold. It supports up to 350 pounds and is made from rust-proof aluminum. The Little Giant Flip-N-Lite 6-foot Stepladder has a large platform at the top for standing or holding tools. It’s 45 inches off the floor. The handrail extends up beyond the top step for security. The ladder easily folds up to fit in a narrow space for storage and it only weighs 14 pounds. The 3-Step Ladder from Giantex is a handy step-stool with large steps and a tool or bucket platform at the top. The highest rung is a roomy platform over a square foot in size. It’s 27.2 inches off the floor, ideal for tasks inside the home. I choose my new stepladder based on its ability to serve as a 12.5-foot regular ladder, a 6-foot stepladder, and a scaffold. If this kind of multi-purpose tool appeals to you, consider getting the OxGord ladder. 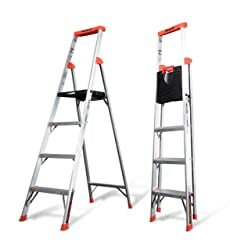 If you want a folding stepladder that can be stored in a narrow space, take a look at both the Flip-N-Lite from Little Giant and the 3-Step Ladder from Giantex. The Flip-N-Lite reaches a top height of 45 inches while the Giantex goes up to 27.2 inches. If you prefer wide steps and a large standing platform, the Giantex 3-Step Ladder offers those features. It has a place to keep your cleaning supplies and tools right at hand. Thank you for reading these reviews today. Stepladders are a tool needed in just about every home. I hope this guide has helped you narrow down your selection to choose your new one today.